The first day's racing from Julie Scott's Ballarat training facility has started with success. Benambra won the Broadbent Grain Classic BM64 Handicap over 1300 meters at Avoca by 3 1/2 lengths eased up in a time of 1:17.6 from Addington Road in second and a further neck back to Rouen. Given the perfect ride by Billy Eagan carrying 59.5 kg. After jumping well he sat outside the leader always travelling well. On straightening Billy gave him some rein and he ran away from the field winning easy. Benambra now an eight year old has won eight races with three seconds and seven thirds and over 90k in prize money from fifty starts. 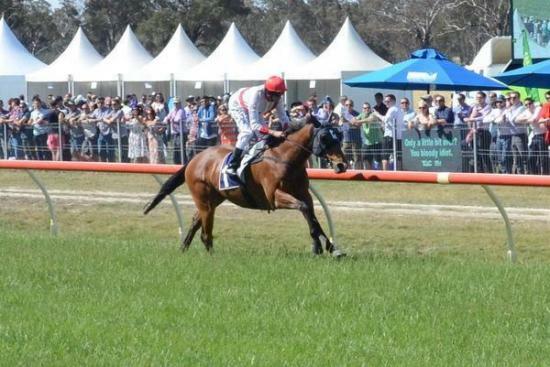 Benambra will have his next start at Horsham over 1400 meters.